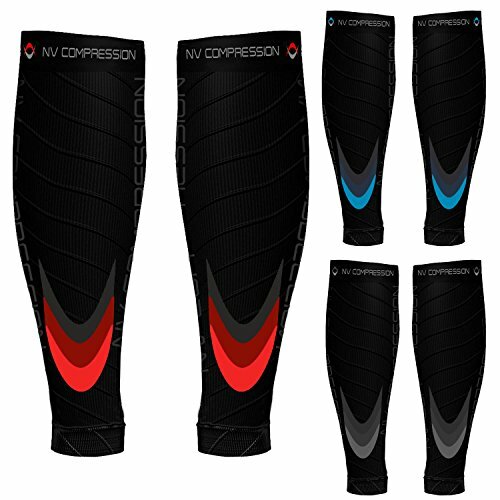 ULTIMATE COMPRESSION WEAR WITH 20-30mmHg RATING: This PAIR of high performance, unisex compression calf guards/sleeves use highly advanced technical yarns and POWER RIBS that provide comfort and recovery DURING and AFTER exercise. 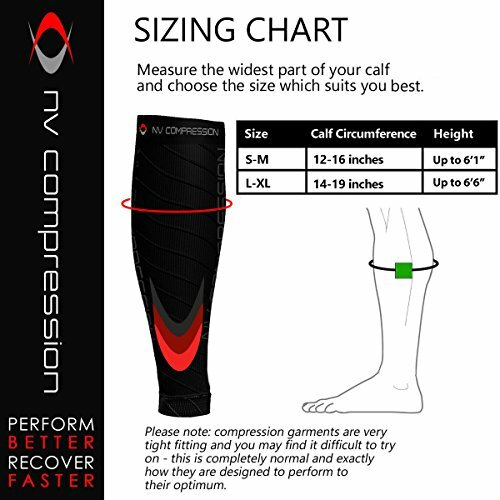 NV Compression guards are fully tested in a state-of-the-art lab passing strict guidelines to meet the 20-30mmHg compression rating. 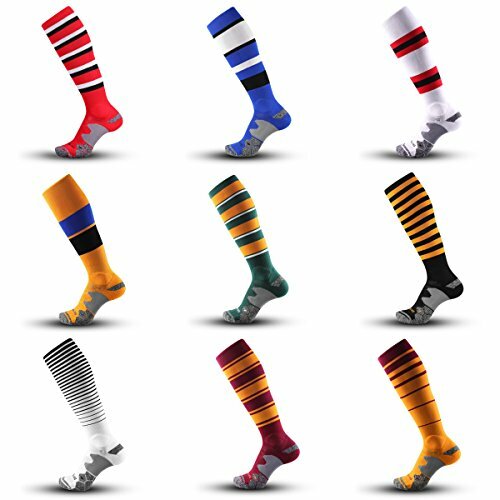 USES: The compression benefits are ideal for all sports activities e.g. running, cycling, soccer, rugby, fitness, hiking, gym, yoga, golf, tennis, squash, triathlon, cross fit, weight/dead lifting etc. 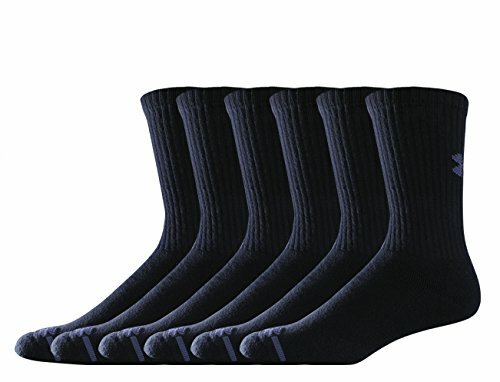 They are also perfect for people who stand up for long periods at work, fly regularly, suffer from calf strains/muscle pulls/Achilles tendon injuries or to combat deep vein thrombosis. 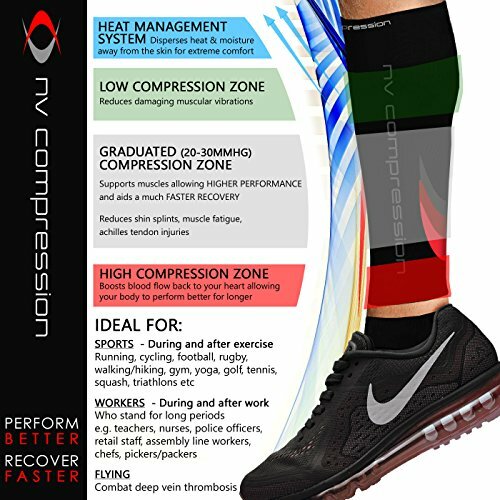 BENEFITS: The graduated compression (from the ankle to above the calf) aids the flow of oxygen to the muscles which improves performance and reduces fatigue. Each sleeve behaves like a second layer of muscle, gently squeezing stretched vein walls. This built-in feature helps fight the force of gravity and circulates blood back up to the heart more efficiently. Use during exercise for support or boost recovery after. 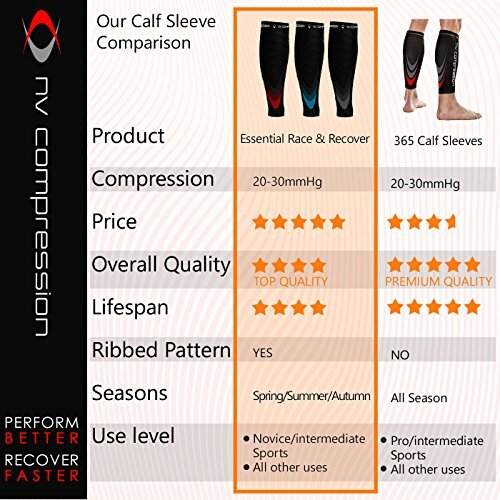 The ultimate pair of Race and Recover compression calf guards/sleeves! Ideal for all sportsmen and women- at any level. Also ideal for people who stand up for long periods at work, fly regularly, suffer from calf strains/muscle pulls/Achilles tendon injuries or to combat deep vein thrombosis! 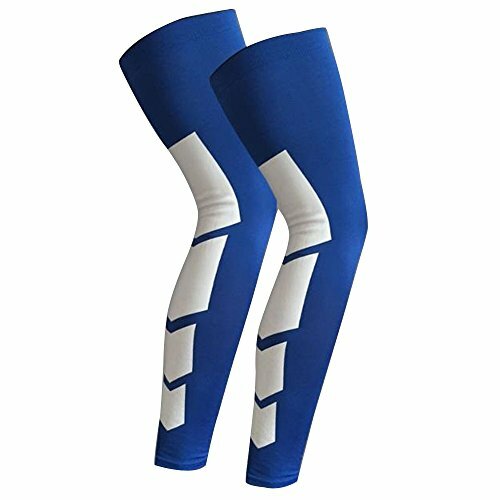 This PAIR of high performance, unisex compression calf guards use highly advanced technical yarns and POWER RIBS that provide comfort and recovery DURING and AFTER exercise. Fully tested in a state-of-the-art lab passing strict guidelines to meet the 20-30mmHg compression rating. If you do not like your new guards please return them in the original packaging for a full refund! USES: Ideal for all sports e.g. running, cycling, soccer, rugby, fitness, hiking, gym, yoga, golf, tennis, squash, triathlon etc. 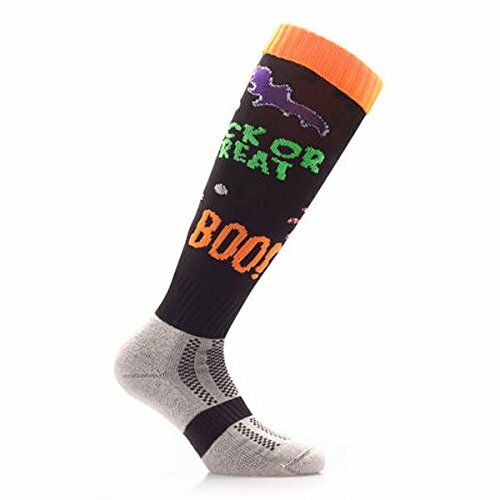 BENEFITS:The graduated compression (from the ankle to above the calf) aids the flow of oxygen to the muscles which improves performance and reduces fatigue. Each sleeve behaves like a second layer of muscle, gently squeezing stretched vein walls. This built-in feature helps fight the force of gravity and circulates blood back up to the heart more efficiently. COMFORT:The advanced cuff weave/design keeps the guards in place – no need to stop to adjust or pull back up! The cuff is reassuringly tight without restricting blood flow. – Available in 2 unisex sizes – please see image for size chart. – Washing instructions: Can be machine washed at 30 degrees or hand washed – always dry flat. Please note: You may find it difficult to put the sleeves on however, compression garments are supposed to be tight – they would not perform correctly if they were too slack. ADDITIONAL INFORMATION: Available in 2 unisex sizes – please refer to product image for sizing chart. WASHING INSTRUCTIONS: Can be machine washed at 30 degrees or hand washed – always dry flat. 100% MONEY BACK GUARANTEE !